A Christmas Bible Activity for Children Called "O Holy Night"
This Christmas Bible activity for children called “O Holy Night” will be a great addition to your Christmas preparations for your children’s church. Your kids will hear the gospel message proclaimed by 6 different twinkling stars of colorful hues. I created this Christmas Bible activity for children called “O Holy Night” a couple of years ago for one of my preschool Christmas chapels. I wanted to creatively share the true message of Christmas based on one of my favorite Christmas carols “O Holy Night.” I wrote a poem about the colorful stars that may have shined up in Heaven on the night Jesus was born. Each of the colors coincides with the five “Wordless Book” colors of gold, dark, red, clean and green. But I added one more color, the color of purple, which reminds us of Jesus’ royalty. For this activity, I use my “Bible Story Boxes.” These were created for me a few years ago by a good friend. As you can see in the presentation, they each turn around and showcase the different visuals. If creating your own revolving boxes seems a little daunting, you can easily adapt this Christmas Bible activity for children called “O Holy Night” onto normal packing boxes. The main point is that you want to creatively showcase your visuals so that your children are drawn into this activity. Click HERE to learn how you can get your own digital download of this activity with all its great printable downloads. Who can find the gold star? Who can find the purple star? Who can find the dark star? And give His life on the cross. This was God’s plan. Who can find the red star? Who can find the white star? Who can find the green star? Looking for another fun Christmas Bible activity for your kids? 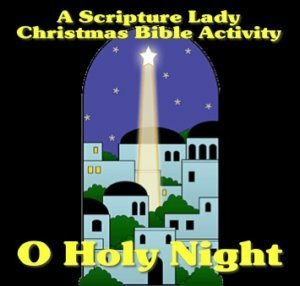 If you liked learning about this Christmas Bible activity for children called “O Holy Night”, then sign up to receive Scripture Lady’s Free Email Kid Tips packed full with creative ideas and receive 12 FREE Bible downloadable resources to help get the kids you minister to excited about the Bible! Just go to www.MyFreeBibleGames.com to fully subscribe. Also, don’t forget to “LIKE” me on Facebook. Thank you!